The Chillon Castle has been around for over 1000 years. The castle that exists today is a medieval style castle that was built in the thirteenth century, on the site of a castle built in the ninth century. Its’ first use is believed to be that of a strategic post for Roman soldiers during the early Middle Ages. The foundation of the current castle was built by the bishops of the Sion and Rhone valley during the eleventh century. The first writing about this castle appeared in 1160, and it was at that time that the castle came under siege and was captured. From 1189 until the thirteenth century, various counts of Savoy ruled the castle. Count Thomas of Savoy began the modifications and enlargements on the castles in 1189, and these changes continued through the thirteenth century. Pierre II of Savoy (Peter II of Savoy) has been accredited for the current structure of the Chillon Castle. His construction consisted of the outer walls, towers and buildings. Machicoulis reinforce the curtain that faces inward as well as the four largest towers. During the fourteenth and fifteenth centuries the gate in the castle was rebuilt, and height was added to the walls and each of the towers. All other major structures were built during this time period. For nearly two centuries, the castle was used as a summer residence for various counts of Savoy. 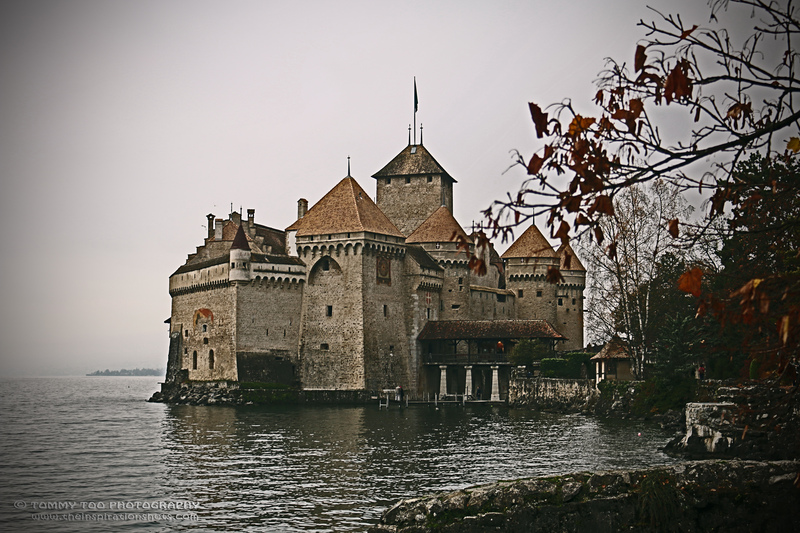 In 1536, the Bernese captured Canton Vaud, the southwestern area of Switzerland’s plateau region and the northern part of Lake Geneva, and the castle became the location of the Bernese bailiff and it was used as an arsenal. It stayed this way until 1798 when the Swiss revolution took place. Throughout the nineteenth century, the castle was used as a prison for the military. Castle Chillon is best known for its location. It is located on an island in Lake Geneva (Lake Leman). It has been built in the most strategic place on Lake Geneva’s northern shore. Lake Geneva grants access to France, northern Italy and western Switzerland. The castle has been placed where the foothills from the Bernese Alps lead down to Lake Geneva, which leaves only a small path along its shores. This is ideal for the castle because it gave the ruler of the castle control of the lake passage, as well as the road passage. The castle is by one of the most important trade and military routes of the time. The castle could only be accessed by a bridge that leads to the gatehouse. Although the castle has over two dozen buildings and three courtyards, it is best known for its dungeons. The dungeons were carved out of the rock that supports the castle’s foundations. Even when there were no permanent rulers of the castle, it was used as a prison.